Steam is coming to your smartphone! Well, sort of; you won't be buying mobile games with your Steam app, and you won’t be able to play your PC games on your iPhone, but then again, would you really want to? No, what you want is the ability to track Steam sales from the comfort of your couch or your spot on the train, and you can do that when Valve ends the beta period and releases the Steam Mobile App for iOS and Android devices. With the Steam app you can chat with friends, view profiles, view screenshots and user-generated content, and take advantage of the incredible Steam sales to pick up great games for a song. While the app may be free, that last perk will certainly impact my wallet, and I'm betting the folks at Valve know it. "The Steam app comes from many direct requests from our customers," said Gabe Newell, co-founder and president of Valve. "Seeing which of your friends are online and playing a game, sending quick messages, looking at screenshots for an upcoming game, or catching a sale - these are all features customers have requested. Mobile is changing way people interact, play games and consume media, and the Steam app is part of our commitment to meet customer demands and expand the service functionality of Steam to make it richer and more accessible for everyone." While the app is available now on both the iTunes App Store and Android Market, the mobile service is currently in closed beta and thus you can't really do anything with the apps without an invitation. Users can “register interest” in taking part in the Steam Mobile beta by attempting to log-in through the app, and more players will be invited as the Steam app nears launch. More details will emerge as invites start going out, but one thing is guaranteed: this will destroy my impulse control. I am now in the beta program for Steam Mobile. Below are some screenshots from the app, and feel free to ask any questions in the comments. 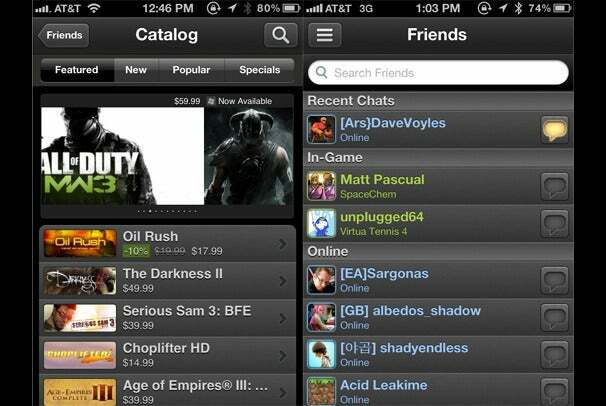 The Steam Mobile app provides access to your friends list, chat window and game catalogue on the go.